What you can do to help make it happen! 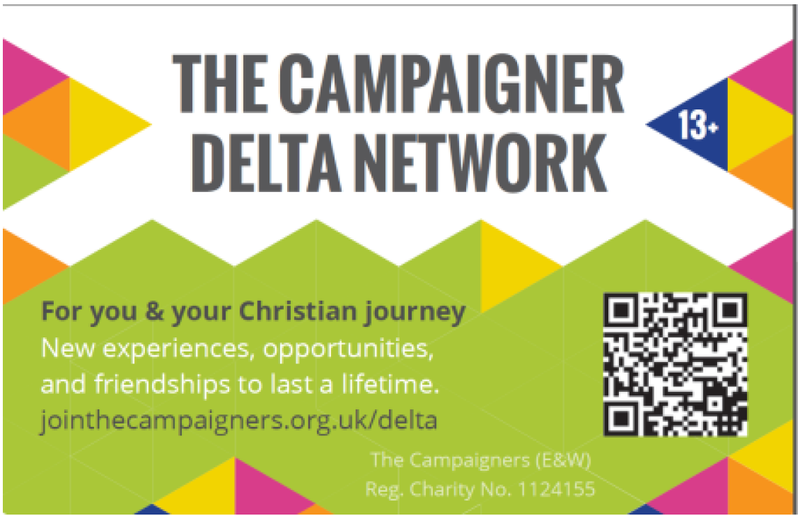 The Campaigner Delta Network is a new and exciting dimension for anyone aged 13+. The concept really comes into its own because it’s an option that brings young people together from existing Delta groups, any other church groups, or indeed from individuals, irrespective of where they live! Together with others, the vision is that members can create their own amazing adventures, events and opportunities – all with a Campaigner flavour and ethos. It not only give young people a real say in the things they would like to do, but it also gives them a chance to turn ideas and aspirations into reality. Working alongside mentors and experts in a variety of skills, they will have the opportunity to develop existing talents and to discover new ones – truly preparing them for Life. We believe that their energy, innovation and ‘Just do it’ attitude are the qualities we seek for a future Campaigner Christian Youth Movement! If you want to know more please go to our newly developed web site. The new banner display units made the Campaigner stall at Keswick look interesting and inviting. There were many visitors to the stall, former Campaigners, those involved in Church Youth work, and young people, whose meetings were on the same site. Are you aware of the recent changes affecting CRB and the new Disclosure and Barring Service? Campaigners are updating their information and literature so please watch the web pages dedicated to our Leaders and we will advise as things develop. If you would like to go direct to details of recent revisions please CLICK HERE. Web pages have been added, exclusively for Leaders and Area Leaders. They are exclusive to Registered Leaders and are password protected. Please click the button to see more details on this development of our support to Centres. 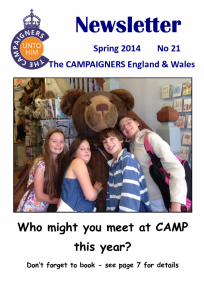 The Spring 2014 edition of the Newsletter and Friends Letter for Leaders and supporters have been published. Both email links and printed versions have been sent out. If you feel that you have been missed on this mailing please let HQ know. It is also available to download on the Leaders web pages. Recently one of our Friends, wanting to make a donation, asked for information and necessary forms to be made available on the website. We have usually circulated these from time to time with the Newsletter to our Registered Leaders, Friends and supporters. However we will create a link at the end of this item shortly. This will allow anyone wanting to support our work to obtain the necessary papers. In the interim please use the CONTACT FORM to ask HQ to provide anything you need in this connection.